One of the most intriguing cars in BMW’s history has to be the BMW Z1. The first of the “Z” labeled roadsters, the Z1 was a fascinating car for it’s time. To be honest, there hasn’t been anything like it since and it’s pushing thirty years old. The first time the public saw the BMW Z1 was in 1987, at the Frankfurt Motor Show. It blew people away with its combination of stylish good looks, removable plastic body panels and slide-down doors. When it went on sale in 1989, order sheets were flying out of Munich. Everyone wanted a piece of the BMW Z1. However, its high-cost (Porsche 911 money at the time) and lack of proper sports car performance led to its well of intrigue running dry in only a few years. Now that it’s a classic, though, its intrigue is back. People crave its quirky design and hilarious doors. But it’s also a good car on its own, without the gimmicks. Based on the E30 BMW 325i, it can properly handle. While it was slower than the E30 325i, it was still sharp to drive and a ton of fun. Especially considering that the fun can be had sans doors. So enthusiasts have been desperate to get their hands on used examples of the BMW Z1. So much so, in fact, that Z1 values have risen drastically in the past few years. For example, this rare 1990 example BMW Z1 just sold at the Bonham’s Auction in Chantilly, France for €69,000 (US$ 77,231). That’s impressive for a 26 year old car. This specific car only had 23,203 kilometers on the odometer and was painted in a very rare and very interesting color, Fun-Gelb (Fun Yellow) Metallic. While I wouldn’t say it’s the most desirable of BMW colors, as it kind of looks like Gatorade yellow, it certainly adds to the interesting factor of the car. On the inside, the combination of cloth and leather normally looks quite good, but this one has a strange pattern on the leather that looks odd. It’s still a cool cockpit, though, especially considering those awesome slide-down doors. 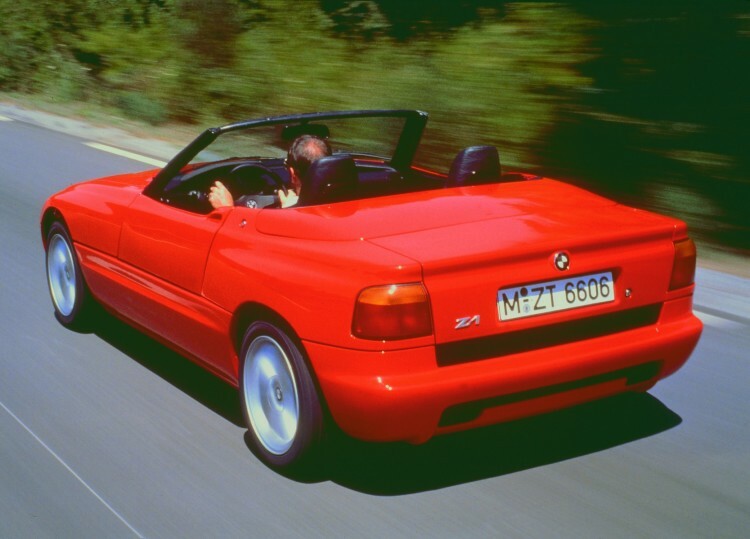 The BMW Z1 has become a classic, one with a large cult following and it isn’t hard to see why. It’s one of the quirkiest car designs ever made and seems very lovable. It isn’t traditionally good looking, it isn’t fast and it isn’t even particularly easy to operate. However, it has a certain “cool-factor” that most other classics do not. And that, alone, is worth the heavy investment. Oh, and did I mention the doors slide down?